Specialist training in the country is largely provided by the public universities through the Masters programme. This programme is governed by the National Conjoint Board of the Ministry of Education and the Malaysian Qualification Agency (MQA). It consists of a four-year structured training programme leading to a Masters degree. Despite the notable achievements and success of this Programme, the country is still facing a shortage of specialists to meet the requirements of both the private and public sectors. The Ministry of Health (MOH) allocates about 1,500 scholarships for the Masters training programme each year. Unfortunately, the Universities are able to offer only 750 to 800 training positions. The Universities are unable to cope with the increasing demand for specialist training. In acknowledging the constraints of the Universities, the MOH has embarked on providing support for 'alternate pathways' for its doctors to become specialists. In the 'alternate pathway' or 'parallel pathway', in addition to the Masters programme, the trainees may opt for one of the programmes of the Royal Colleges of the United Kingdom or Ireland. Thus, the trainees have an option to undergo the Masters programme or the Royal Colleges' programmes to be become specialists. The MOH plans to strengthen the 'alternate pathways' by making it more structured and to train the trainers and to accredit the clinical facilities. The Colleges of the Academy of Medicine of Malaysia will collaborate with the MOH and the Royal Colleges of the United Kingdom and Ireland in the specialist manpower development agenda. The approach to specialist training using the Royal Colleges' pathway is not totally alien to us. In the era soon after independence, specialist training was entirely dependent on the overseas Royal Colleges' programmes. Postgraduate training was conducted using the apprenticeship model in the MOH hospitals where trainees with appropriate supervision for a variable period of three to four years would qualify to sit for the Royal Colleges' examinations. Successful candidates who obtained the MRCP, the MRCPH, the FRCS or the MRCOG diploma, would be gazetted as specialists. The introduction of the Masters programme in the 80's resulted in a change in the approach to specialist training. The apprenticeship, unstructured training in the MOH hospitals, yielded to a structured, University-based training programme. Although the Masters programme is currently well recognised, the traditional apprenticeship model leading to the Royal Colleges' diploma continues to be popular for Internal Medicine, Paediatrics and Obstetrics and Gynaecology. The 'alternate pathway' not only provides greater opportunities for specialist training, it also accord some flexibility to the trainees. It allows trainees to pursue specialist training fairly early in their career and without disruption to their service to the MOH. Because of the large clinical load in the MOH facilities, the trainees gain sufficient clinical opportunities to fulfil the educational requirements and achieve competence in their relevant specialty. While there are advantages of the 'alternate pathway' for specialist training, it is important to ensure that the quality of training is not compromised. The challenge will be to develop good governance for the 'alternate pathway'. While the trainees can continue to provide service while training, it must be remembered there must be an appropriate balance between service provision and learning. Training should only be undertaken in clinical facilities that provide high quality supervision and management. It must be provided by qualified and experienced clinicians who are committed to achieving excellence in training. Protected time must be provided for the trainers and the trainees to undergo their training, and bottlenecks in the career structure must be reduced. The Colleges of the Academy have played a pivotal role in supporting the development of the 'alternate pathway' for specialist training. The Colleges have leveraged on their networking and excellent relationship with overseas Royal Colleges to help realise the MOH's agenda. 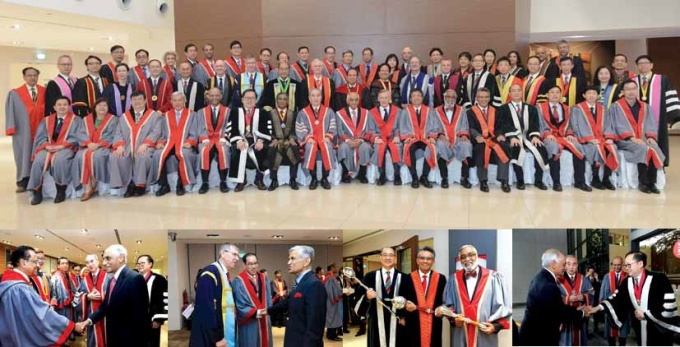 The College of Surgeons, Malaysia, has signed a Memorandum of Understanding on 27th August 2014, with the Royal College of Surgeons of Edinburgh (RCSEdin), with respect to providing fellowship training in cardiothoracic surgery, plastic surgery and orthopaedic surgery. The training shall be provided in selected hospitals in the country and the RCSEdin shall take responsibility for the assessment and certification. The Cardiothoracic Surgery is proceeding with preparations for the fellowship training. Similarly, the College of Paediatrics has signed a Memorandum of Understanding with the Royal College of Paediatrics and Child Health, United Kingdom, on 14th October 2014, for the conduct and administration of the MRCPCH examinations in Malaysia. Discussions are in progress to strengthen the training of paediatricians. The College of Physicians has held discussions with their counterparts in the United Kingdom to develop ways to enhance the Medical Training Initiative and the possibility of signing a Memorandum of Understanding in this regard. The College of Physicians will receive a team of experts from the Federation of the Royal Colleges on 7th to 8th December 2015, to deliberate on curriculum development, professional development, as well as the training and assessment aspects, both for MRCP and potentially, the Specialty Certificate Examination. The Council of the College of Anaesthesiologists had their preliminary discussions on using the 'alternate pathway' to train specialists with the President and the Chief Executive of the College of Anaesthetists of Ireland, on 17th to 18th November 2015. It is hoped that the Colleges of the Academy will continue to play an active role and contribute positively to enhance the specialist manpower development in the country. The mission of the Academy is to promote the highest standards of healthcare through professional and ethical practices. The quality of healthcare is critically dependent on the quality of our postgraduate training. Specialist training in the country should no longer be in the exclusive domain of the public universities; it should be a collaborative effort of all stakeholders. The MOH should maximally and optimally utilise the expertise and resources that are available and create opportunities for training in all specialities, including family medicine and public health. While the MOH must be complimented for creating options for specialist training, it is vital that the training programme is rigorous and quality assured. The 'alternate pathway' should not be second class to the Masters programme or any other recognised overseas specialist training programmes. It is my great honour and pleasure to welcome all of you to the 49th Singapore-Malaysia Congress of Medicine. The theme for this congress – "Greater Integration for Better Patient Care" is very pertinent and timely. One of the great achievements of the twentieth century is a dramatic rise in life expectancy. The number of people over the age of 65 years has dramatically increased, and this growth will continue. Unfortunately, older persons are vulnerable to chronic medical conditions. It is not uncommon for them to have multiple co-morbid. As a result, they often seek consultation from several healthcare workers, located in different offices and settings. These services are often not patient-centered, poorly coordinated and result in inefficiencies, escalation of health costs and poor outcomes. The current healthcare system has difficulties in caring for older patients, we need a system that is age-friendly. I am sure this Congress will provide the participants with new insights in caring for these group of patients, more efficiently and effectively. For the new specialists who are to be inducted this evening, my heartiest congratulations! Your induction as a Fellow of the Academy of Medicine, Singapore, is a significant milestone in your career. It marks the beginning of new opportunities. However, please remember that it comes with heavy responsibilities as well. I wish each of you every success and a bright and happy future. 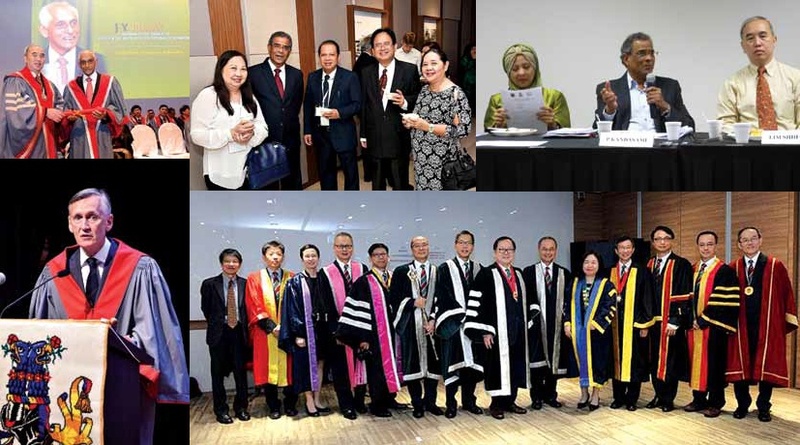 The jointly organised Congress of the Academies of Singapore and Malaysia is an annual event since 1966. The meeting has evolved to become a significant forum for members and colleagues to not only share their experience in their clinical work and research, but also to reconnect with old friends and make new ones. Over the years, the Academies have worked together in a variety ways to ensure high standards of professional practice. Next year, 2016 marks the completion of 50 years of this incredible partnership. It is fittingly that we celebrate this historic occasion; and I take this opportunity to cordially invite you to the Golden Jubilee Celebrations of the Malaysia-Singapore Congress in August 2016. The relationship of our two Academies with the Hong Kong Academy of Medicine, will be further strengthened with the organisation of the 3rd Tripartite Congress as well. We look forward to welcoming you to Kuala Lumpur, and we promise you a most delightful experience. It is my honour and great pleasure to welcome you to the 11th MOH-AMM Scientific Meeting, incorporating the 18th NIH Scientific and Annual National Ethics Seminar. On behalf of the Academy of Medicine of Malaysia, I would like to thank YB Datuk Seri Dr S Subramaniam, the Honourable Minister of Health, for his gracious presence here to officiate the opening of this joint scientific meeting. 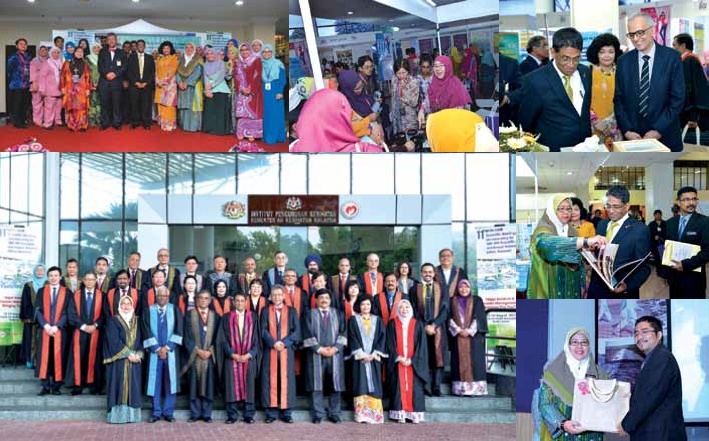 The jointly organised scientific meetings of the Ministry of Health Malaysia and the Academy of Medicine of Malaysia or 'MOH-AMM' as it is more popularly called, has progressively evolved over the years. It has to become a significant forum for profession to not only share their experience in their clinical work and research, but also discuss issues that are topical and relevant. This year's theme "Major Incident & Disaster Management: Bridging the Gap" is an appropriate topic for deliberation, especially after the recent experiences with several catastrophic incidents in the region. While we may not be able to avert or eliminate threats of disasters, we hope this forum will focus on creating plans to decrease the impact of disasters and put in place, good disaster management plan. This afternoon, we will induct 125 colleagues as members of the Academy. I would like to congratulate all those who will be inducted as members of the Academy in your respective Colleges, and welcome you to the Academy. You have worked very hard to earn the title and the privilege. But please be reminded that this title comes with heavy responsibilities. This afternoon, you are made to wear an academic gown; wearing the gown is not just another ceremonial event. It is to remind you of your obligations to your profession and the society. You must continue to strive to maintain and safeguard the standard of specialist medical care in this country. I wish you the best for a bright future. Over the years, the Ministry of Health and the Academy have worked as partners in a variety of ways to ensure high standards of professional practice. One of the most significant achievements of this partnership has been the establishment of the National Specialist Register (NSR). This project has been work-in progress for more than two decades. It has been no easy task. It has taken many successive Director-Generals of Health and Masters of the Academy, numerous meetings, debates and workshops to fine-tune the various aspects of the Specialist Register. Various professional bodies and specialty societies contributed to defining the criteria for specialist recognition. Members of specialty societies contributed their precious time and effort to vet through hundreds of applications. Despite enormous obstacles, many angry applicants, and lots of teething problems, we have made remarkable progress. To date, we have 7,105 medical practitioners registered in the Specialist Register, and it has become a reference point for private hospitals and the public to verify the status of a medical practitioner. The development of the NSR has strengthened our relationship with the Ministry of Health and the Malaysian Medical Council, and more importantly, it has helped us advance our objective to improve the quality of healthcare in the country. The amended Medical Act requires doctors to keep abreast with advances and developments. The Act requires doctors to acquire compulsory CPD points for the renewal of the Annual Practicing Certificates (APCs) and their revalidation of specialist registration. The Academy is in discussion with the MMC to manage the CPD programme for specialists. We have formulated a CPD Grading System, after consultation with all the stakeholders. The Academy has also developed a system to monitor the CPD points and we are in the process of testing it. We hope to align the CPD points of our members to the renewal of the APCs and revalidation of their specialist status in the NSR. Over the years, advances in medical science and technology have changed the face of healthcare. Specialisation and sub-specialisation have become an inevitable trend in medical education and training. The profession has a duty to ensure that the training of the workforce is aligned to the needs of the changing health service. While there has been rapid influx of medical graduates in the recent years, the country continues to experience a significant shortage in specialist manpower. Medical graduates take too long to become a specialist (10 to 12 years) and they have to face many obstacles along the way. There are bottlenecks in the training pathway, and this is likely to worsen with increasing number of medical graduates. The postgraduate training has not paid attention to the training of medical officers in the MOH, who have been described as 'the lost tribes of medicine'. An important problematic aspect of our postgraduate training that needs to be mentioned, is the gap between competence and performance, ie. knowing and doing, especially in surgery. Postgraduate medical training in the country is a very complex activity. Multiple organisations are involved in its conduct and they include the MOH, the universities, specialty bodies, the JPA as the primary financial supporter, the Ministry of Higher Education and the NSR. Postgraduate medical training in the country is fragmented, lacks collaboration and coordination. The stakeholders often have overlapping and competing interests and responsibilities. There is a lack of clarity on the roles and responsibilities of the various parties in the specialist training programmes. There is no one organisation "in charge". We need an overarching governance structure to provide an overall direction to Postgraduate education and training in Malaysia. The specialty training or the Masters Programmes are provided by local public Universities. The programmes are wellstructured with good governance, leading to a Master's Degree. The National Conjoint Board oversees all the Master programmes and the Specialty Conjoint Boards administer their respective disciplines. The medical specialist training in the country is heavily dependent on the Master's Programme. Unfortunately, the universities are unable to increase the opportunities for specialist training in tandem with the increasing number of medical graduates. On the other hand, the development of subspecialty or the Fellowship training programme has been less than uniform. Initially, the subspecialty training programme was developed by the Ministry of Health to cater for its own needs. However, over the years, the universities and the specialty societies have embarked on delivering the programmes. Standards of training and assessment between the various institutions are inconsistent. Ideally, specialty and subspecialty training should be integrated and there should be a logical progression until the doctor can practice independently in his/her area of specialty. Specialty and subspecialty training should be a single process. Postgraduate training has been a collaborative effort of the MOH, the Universities, the private sector and the Academy. Training must utilise the expertise and facilities available in the MOH, the Universities and the private hospitals. The practice of medicine has changed, and the approach to specialist training which we considered appropriate 20 years ago, are less than adequate now. We need to train doctors who are 'fit for purpose' to undertake the tasks which patients need. The Academy must take a lead role in these inevitable reforms in postgraduate medical education and training. It must urgently, call for a national deliberation to identify issues and design new pathways for training. As the Academy celebrates its 50th Anniversary next year, it must remain as the guardian of educational standards and training in the country. I wish to extend my gratitude to the organising committee for their hard work and diligence. With over 700 registrations, this conference is a huge success. Many congratulations! Once again, I would also like to thank YB Datuk Seri Dr S Subramaniam, the Minister of Health, for kindly setting aside some time from his busy schedule to officiate this scientific meeting. Thank you Sir! I hope you have an enjoyable meeting. 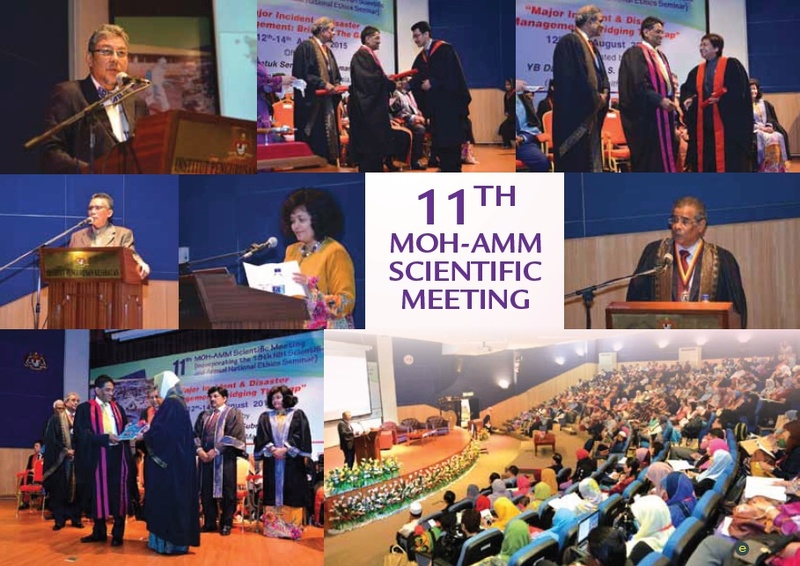 The 11th MOH-AMM Scientific Meeting, incorporating the 18th NIH Scientific and Annual National Ethics Seminar 2015, was held from 12th to 14th August 2015. 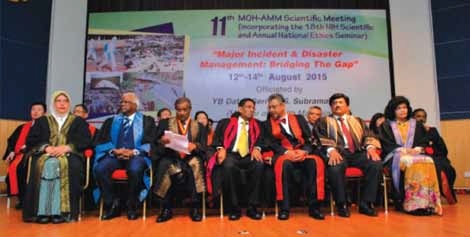 This year's theme was "Major Incident & Disaster Management: Bridging the Gap". The event was co-organised by the Ministry of Health and the Academy of Medicine of Malaysia, with the National Institutes of Health Malaysia (NIH); namely, Institute for Health Management (IHM), Institute for Health Systems Research (IHSR); Institute for Public Health (IKU), Institute for Medical Research (IMR), Institute for Health Behavioural Research (IHBR) and the National Clinical Research Centre (NCRC). The Institute for Health Management (IHM) was the host for the three-day event. The event aims to disseminate research information and facilitate interaction among researchers and healthcare providers, and other stakeholders. A total of 809 delegates from and within the Headquarters of MOH, State Health Departments, NIH Institutes, NGOs and independent bodies, attended this event. The event was officiated by the Minister of Health Malaysia, Yang Berhormat Datuk Seri Dr S Subramaniam, on 13th August 2015. 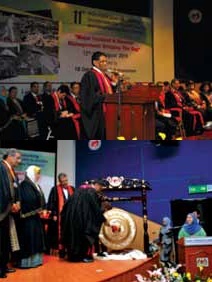 The ceremony also included the launching of the "Journal of Health Management (Special Edition): Flood Disaster, December 2014 – January 2015" and the "Guidelines on Use of Human Biological Samples for Research", the fellowship conferment, the induction ceremony, as well as the 13th Tunku Abdul Rahman Putra Address by Yang Bahagia Tan Sri Dato' Dr M Jegathesan. The event wrapped up in the evening with the Minister visiting the exhibition booths at the lobby. In collaboration with the Corporate Communication Unit (UKK), the Ministry of Health Malaysia, the national media organisations were invited to cover the ceremony officiated by YBMK, Datuk Seri Dr S Subramaniam. A total of 122 posters were reviewed and accepted by the scientific committee for poster presentation. Out of 122, 15 posters were related to disaster management particularly floods. However, seven posters were voluntarily withdrawn from the competition. The top five posters were selected and each winner received RM500 in cash and a certificate. On top of that, a total of 27 posters covering the Malaysian Health Systems Research Project were displayed for public consumption during the event. The Government of Malaysia and the MOH have engaged the Senior Advisory Team (SAT) from Harvard University to work with local counterparts on the Malaysia Health Systems Research project (MHSR). A key component of the MHSR is significant transfer of technology and skill building amongst Malaysian researchers. At the market place, each analytical team displayed their own posters on research activities and methodology. Four plenary and six symposium sessions with a total of 20 speakers were conducted during the event with various speakers from various backgrounds. In addition, the speakers also came from the NGOs and the private health sector. Each plenary were chaired by the Director of each research institute under the NIH, as well as the Senior Members from the AMM. All the invited speakers are experts in disaster and crisis management. The panel of expert speakers from the public, private and academic institutions presented a wealth of knowledge, researches and experiences in the various fields and disciplines. The majority of the speakers came from the ground, self-experienced, and well-prepared to share their experience facing the crisis or incident management. Recent episode of floods, earthquake series and plane crashes attracted the delegates towards the presentations. Most delegates were satisfied with the topics presented and the feedback given was good. The National Ethics Seminar challenged healthcare professionals with ethics in their practice, monitor healthcare performance with disciplines to guide practice patterns. For the Tunku Abdul Rahman Address, we are very fortunate to have the Olympian Tan Sri Dato' Dr M Jegathesan whose sprint records in the Asian Games remain unbroken for almost 50 years. He shared about fairness and the ethics of keeping the sports clean. In terms of leadership skills during crisis and disaster management, Tan Sri Dr Jemilah Mahmood; the Chief of the World Humanitarian Summit Secretariat was invited to share her experience and thoughts in the session known as Talent Grooming Programme (TGP) Inspirational Leadership Podium Series on the third day of the event. Overall, the event was conducted smoothly and showed great effort from all committee members. The initial planned activities have been managed in the best possible way and everything ran smoothly. This meeting has enlightened the participants with a great learning and rewarding experience. We hope that the research-related activities will serve as a platform for knowledge translation and to promote the use of scientific evidences in practice and decision-making, thus, translating research into the disasterrelated health policies. We thank the panel of experts, the organising and scientific committees, as well as the Secretariat for the untiring efforts and contributions to make this conference a grand success. First of all, let me thank the organisers for this esteemed honour that has been bestowed on me in being selected as the speaker at the Tunku Abdul Rahman Putra Oration this year. Whilst there is a designated topic for the oration this year, it will not only be appropriate but mandatory as well, for me to spend the first few minutes talking about the honouree in this series of oration, namely, our beloved "Bapa Merdeka", the Tunku himself. I crave the indulgence of the audience to focus on my personal anecdotes of the man rather than to extract highlights of more hallowed biographies. I first laid my eyes on the Tunku as a 14 year-old when my father 'ordered' me to return from school in Singapore, to be present at the Dataran Merdeka in Kuala Lumpur, on the 30th August 1957. My father, a recently retired government officer, implored: "A country is not born every day. You be here". Dutifully, I turned up. I was amongst the crowd that stood there and witnessed Malaya being declared an independent and sovereign nation, and was totally mesmerised to see the Tunku standing on the podium and shouted "Merdeka" so convincingly. He certainly cut a larger than life figure. I was equally taken in by the new flag that rose slowly up the flag-pole, in tune with the rendition of the national anthem we heard for the first time. The song and the flag were to take on a very special personal meaning for me. I had by then, been already primed to watch the Olympics held a year earlier, where winners on the podium were honoured and their countries recognised by the raising of the national flag and the playing of the national anthem. Being already a budding school athlete at that time, I resolved to work towards international success and I told myself at that instant, that one day, I will stand on the rostrum and have them raise the flag and play the anthem for me. I am happy to state that I did realise this dream and enjoyed the hair-raising experience eleven times in the years that followed. Two personal anecdotes will illustrate the type of man the Tunku was. Ten years on, from Merdeka day, I had just reported for work at the General Hospital as a houseman and after a lunch along then Batu Road (later Jalan Tunku Abdul Rahman), I was waiting to cross the road to get to where my car was parked. A VIP motorcade passed by, and to my total surprise, it came to an abrupt halt in front of me. The VIP wound down the window and to my amazement, I recognised the Tunku as the passenger. He smiled and said, "Do you need a lift somewhere" Wow! The Prime Minister himself stopping to offer me a lift. Though almost rendered speechless, I managed to croak "oh, thank you so much Sir, I have managed to buy a car." I should not have been over-surprised though, because in the intervening years during which I had made my mark as the leading sprinter in Asia, my efforts had not passed unnoticed by the sports loving Tunku who never failed to send a congratulatory message, by telegram or letter, as was the social media of those times. Messages that read like, "Well done Jega, the country is proud of you". One year later, enroute to the Olympic Games in Mexico, I stopped in London to compete there, and was invited by the Malaysian Embassy there to attend a function to honour the visiting Tunku. He spotted me in the periphery of the crowd, called me to come over and asked what I was doing in London. He then asked how did I do in the competition and I replied that I had injured a muscle and had to pull out of the race. He was abhorred and said I had to recover quickly to be in time for the Olympics, and told me to come to his London residence at York House the next morning, so that he could give me a massage machine. Once again, needless to say, I was indeed stunned by his caring attitude. Therefore, whilst I could have chosen many other topics to talk on today, including some that reflected my many years of work in microbiology and infectious diseases, I have chosen to speak instead of a topic which I have also been engaged with for many years in a parallel fashion, namely, about issues such as doping in sports, gender issues and age cheating. This would have been of interest to the sports fan in Tunku who came from an era where fair play and integrity in sport were a given. It has long been accepted that medical and scientific input are a 'sine qua non' in today's elite sporting landscape. Traditionally, the medicos have been responsible for three major components, namely, Athlete's well-being through prevention, treatment and rehabilitation of illnesses and injuries; legitimate use of sports science to improve training methods and performance, and keeping sports fair and clean. These objectives have essentially been achieved through provision of services, as well as through bearing influence in formulating and/or changing sports rules. This paper is dedicated to the discussion on the last of these, and will be concerned with the issues of doping in sports, gender issues, gene doping and age cheating. Whilst these issues have been around for relatively a long time, there is now an urgency in desiring to tackle them in view of their even more emerging presence in the current sports scenario riddled with mega dollars and accompanying unbridled greed bringing on both 'push' and 'pull' factors for athletes to cheat. The positioning of doping in sport as a major global problem, is certainly acknowledged, evidenced from the massive media attention and coverage that these stories attract to the inclusion of a statement in no less than the hallowed Olympic oath and the ever growing and pervasive visibility of WADA, the World Anti-Doping Agency. And why this attention? Because of the need to preserve the sanctity of sport in the spirit of olympism, because these drugs can damage health and because sports persons are role models for the youth of the world. Athletes take drugs to enhance performance through specific action on strength, on stamina, to stimulate and to mask. Athletes who do get caught though are not all willful drug takers. Many fall into the category of the 'innocent' who have actually made a mistake through ignorance or carelessness. Yet others fall into the category of 'victims' being induced or coerced to do so by people in authority over them. For long, in sanctioning, this has not been acknowledged within the context of the strict liability rule. This is however, about to change with modifications to the WADA code which will recognise the philosophy of proportionality of fault and applies sanctions with corresponding flexibility. Meantime, the thrust of the anti-doping global strategy hinges on four pillars, namely, education, rules and regulations, testing in and out of competitions, and deterrence through sanctions. The battle is however, far from being won, and faces many challenges ranging from perception to reality of failing to catch the cheats, an ever emerging armamentarium of new drugs, inability to test for all those already known and cleverer methods of avoiding detection. Legal challenges and their attendant costs are an increasing worry. These are being countered by a slew of measures including the widening of the definition of anti-doping rule violation, the broader use of non-analytical violations, rewards for whistle-blowing, criminalization of sources of supply, introduction of new approaches such as the athletes biological passport, as much as increasing direct funding for research to find improved analytical methods for detection. Another issue that occurs from time to time, is "suspicion" that an athlete in a women's event is not really a female. The emergence of the Press "sisters" as runaway winners in athletic meets in the 60's could be said to have heralded attempts to introduce "gender verification" at games as a condition for participation. Such tests evolved from rather crude attempts to visually examine athletes physically and then moved on to the less intrusive chromatin (or Barr body) test performed on cells derived from buccal smears. Those athletes who "passed" the test were issued "femininity certificates", and allowed to compete. Those who failed were ignominiously thrown out of the games. Such tests held sway for almost a decade before they fell into disrepute and were abandoned as a conditional pre-games requirement. This is not to say the problem disappeared and challenges of an athletes' gender continued with different sport organisations dealing with them within their own procedures or rules. Whilst lead authorities have had various conferences and issued consensus statements, the solution to the problem is far from systematised and can be considered to be evolving. The IAAF has come up with new rules and regulations which appear to have gained some traction amongst interested parties and is now subject to the jury of international opinion. The new procedures are addressed at tackling the issue of "females with hyperandrogenism" and are directed at keeping out of women's events athletes who have a male hormone profile. Such athletes will go through a three-step examination process and if found ineligible, will still have possibilities of returning to the fold if appropriate medical procedures are undertaken to reverse this advantage. What is most important is that, all of these are conducted with the greatest respect to the athlete's confidentiality recognising the sensitivity surrounding the subject of gender identification and the oftentimes unfortunate circumstances that lead the athlete to be in this position in the first place. Age related competitions bring to the fore the question of authenticity of an athlete's age eligible to participate within the age range defined for the competition. Whilst some cases possibly could be attributed to genuine mistakes caused by delays/in accuracies in birth registration within certain jurisdictions, there is no doubt, there are indeed cases of willful fraud and cheating to enhance chances of winning. Such practices can be individual or group initiated to gain advantage and enhance potential for success and all the rewards they carry nowadays. Clearly, such practices cannot be left unchallenged, and apart from investigating birth documents and the like, the medical fraternity is being called upon to assist in coming up with tests that can verify true age. There are indeed methods for age determination such as radiometric measurements of bone, long bone ossification, fusion of epiphysis, dental development, however, they all lack precision in terms of sizable biological variation often related to ethnicity, genetic makeup, nutritional status etc., such variation can extend from 12 to 18 months. However, some sports bodies have introduced such tests and have disqualified athletes based on results not without controversy. Whilst sports bodies are still grappling with these time honored issues, new challenges emerge, most notable amongst these is the very real spectre of "gene doping" techniques already exist to make this an imminent if not already existing possibility, and have been visibly proven in mice at least. The authorities are also proactive in watching out for this as WADA has already included in this, in its list of prohibited methods and expert groups are in place to come up with detection methods. There are thus, these many challenges to the integrity and sanctity of high level sport a la the spirit of olympism. The positive news is that, there is little tolerance for this amongst the authorities and measures are in place, albeit in some instances in an evolving way. Whilst many may say that the war is far from being won, most believe that progress is being made and efforts must not be let up. Education, awareness, rules and regulations, sanctions on those who break them, must continue unabated in ensuring a level playing field for the majority of athletes who believe in fair play. This year's World Mental Health Day was celebrated on the 10th of October with the theme, "Dignity in Mental Health". Working for 25 years in Psychiatry in Malaysia, I see very little change in how we treat our mentally ill, and I fear that dignity in mental health is still lacking. Thousands of mentally ill are locked away in Institutions for years with hardly any contact with the outside world and no belongings. Psychiatric wards are often scary, dreary and caged environments that lack the healing therapeutic ethos for the suffering mentally ill. I often ask my medical students at the end of their psychiatric posting if they would volunteer being admitted to the psychiatric ward and they resoundingly say "No". They also refuse to have their family member admitted. Funding for psychiatric services is far short of what is committed and available in developed countries. Community teams are scarce and staffing is skeletal. Most psychiatric services in developed countries have moved away from long-term admissions to more assertive community management. Here in Malaysia, psychiatric units still have no psychologists who are essential in the team approach to recovery. The number of psychiatrists per population is very short of what is recommended and attracting doctors to postgraduate psychiatry is a real challenge as it seems to be a discipline that is discriminated against, and less lucrative in terms of remuneration. Private hospitals do not have psychiatric units and this is largely because most insurance companies do not cover for psychiatric conditions, leaving patients with little choice if admission is required. Mental illness is still a taboo topic and experiences immense stigma throughout Malaysia. This is in spite of prevalence rates increasing. The National Health and Morbidity survey, 2011 shows that 13% of adults and 21% of children (5 to 15 years of age) suffer a mental disorder. These rates are equal or are more than the number with diabetes but still awareness and acceptance is dismal. Many primary care health staff and General Practitioners are not involved in managing mental illness leading to its accessibility being compromised. There exists a lot of stigma towards the mentally ill, and support groups are few. Progress and ensuring Dignity in Mental Health can only be effected by a mind-set change, first by health professionals and policy makers. Recovery models should be embraced in managing mental illness, and the community needs to be educated and empowered to better their attitudes, support and rehabilitation of those with an illness. Prevention measures have to be emphasised through better parenting skills, inclusion of mental health in the curriculum of schools and support for communities at risk. Multidisciplinary teams should be accessible to provide a more holistic approach to those with a mental health problem. Overall, there needs to be a sincere commitment to improve our approach and not have another 25 years of stagnation in provision of psychiatric services. Below, is an excerpt for the WHO module on "Dignity in Mental Health", the 2015 World Mental Health Day theme. All over the world, people with mental disabilities, intellectual disabilities and substance abuse problems are subject to poorquality care and violations of their human rights. Mental health services fail to integrate evidence-based treatment and practices, resulting in poor recovery outcomes. The stigma associated with these conditions means that people experience exclusion, rejection and marginalization by society. Misconceptions about people with such disabilities – that they are incapable of making decisions or taking care of themselves, that they are dangerous or objects of pity and welfare – mean they face discrimination in all aspects of life. They are denied opportunities to work, to get an education and to live fulfilling, independent lives in the community. Ironically, some of the worst human rights violations and discrimination experienced by people with mental disabilities, intellectual disabilities and substance abuse problems is in health-care settings. In many countries, the quality of care in both inpatient and outpatient facilities is poor or even harmful and can actively hinder recovery. The treatment provided is often intended to keep people and their conditions 'under control' rather than to enhance their autonomy and improve their quality of life. People are seen as 'objects of treatment' rather than human beings with the same rights and entitlements as everybody else. They are not consulted on their care or recovery plans, in many cases receiving treatment against their wishes. The situation in inpatient facilities is often far worse: people may be locked away for weeks, months and sometimes years in psychiatric hospitals or social care homes, where they experience terrible living conditions and are subject to dehumanizing, degrading treatment, including violence and abuse. It is critical to assess and improve quality and the observance of human rights in both outpatient and inpatient facilities in order to change this situation. A comprehensive assessment of facilities can help to identify problems in existing health care practices and to plan effective means to ensure that the services are of good quality, respectful of human rights, responsive to the users' requirements and promote the users' autonomy, dignity and right to self-determination. Assessment is important not only for reforming past neglect and abuses but also for ensuring effective, efficient services. 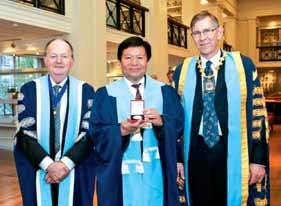 The prestigious Royal College of Surgeons of Edinburgh has awarded a Malaysian surgeon a medal for distinguished services to the field of surgery. Associate Professor Hanafiah Harunarashid, the Director of the Advanced Surgical Skills Centre (ASSC), Universiti Kebangsaan Malaysia Medical Centre, received the Royal College of Surgeons of Edinburgh (RCSEd) International Medal at a diploma ceremony at Edinburgh College, on the 9th October 2015. Dr Hanafiah is the first Malaysian to receive this prestigious honour in the 500-year history of the Edinburgh College, and indeed one of the youngest. A reputable consultant vascular surgeon, Dr Hanafiah is recognised for his instrumental role in establishing the stateof- the-art surgical skills training centre ASSC, as well as his active promotion of quality assessment for the MRCS and JSCFE examinations and other RCSEd activities conducted in the region of Asia, particularly Malaysia. 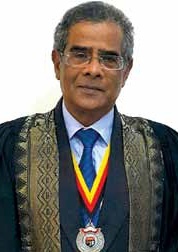 Commenting on Dr Hanafiah's achievement, President of The Royal College of Surgeons of Edinburgh, Mr Ian Ritchie said: "RCSEd is very proud of the accomplishments of its Fellows and Members, and of their outstanding service to the profession, and Dr Hanafiah's' contributions to surgery, exemplify this quality. I take great pleasure in presenting the Overseas Medal to mark his outstanding contributions to international surgery." "It is indeed a great honour to be awarded this Medal. It is always a pleasure to work with colleagues from all over the world, including those at RCSEd, who have similar zeal for education and training. I look forward to continue working with them to educate the next generation of surgeons, said Prof Hanafiah. He dedicates this lifetime achievement to his parents and family, teachers, mentors and his students. Dr Hanafiah originates from Temoh, Perak. 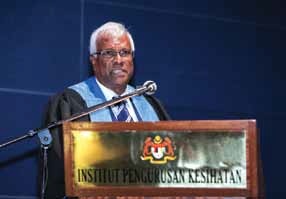 He received his secondary education at the Malay College Kuala Kangsar and graduated from the Universities of St Andrews and Edinburgh, Dr Hanafiah is currently the Senior Vice-President of the College of Surgeons, Malaysia, and also the Vice-President of the Vascular Society. He is one of seven International Surgical Advisers appointed by RCSEd, the oldest surgical institution in the world. Professor Datuk Dr Looi Lai Meng, Scribe of the Academy of Medicine of Malaysia, was recently awarded the Gold-Headed Cane by the World Association of Societies of Pathology and Laboratory Medicine (WASPaLM). The Award Ceremony took place at the 28th World Congress of Pathology and Laboratory Medicine in Cancun, Mexico, on 18th November 2015. This is the highest honour awarded by the World body, for outstanding leadership and contribution to pathology at the global level. The first recipient of the Gold-Headed Cane was Sir Alexander Fleming.